Rep. Matt Salmon is “taking a serious look” at a primary run against Sen. John McCain in 2016, a source close to the representative told National Journal on Thursday. The statement is the strongest indication yet that the tea-party-backed politician from Arizona might leave his House seat to challenge the five-term incumbent. The source, who requested anonymity to speak candidly about Salmon’s possible plans, said the congressman has been “gratified by the strong level of support” he’s seen from supporters, and would likely make a decision by early August. If Salmon runs, it would begin what would likely be the election cycle’s most closely watched primary, pitting the former GOP presidential nominee against a sitting lawmaker with the strong support of local and national conservative groups. 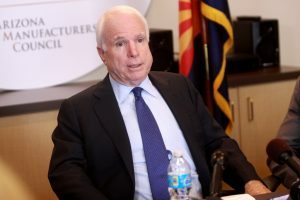 Adding to the intrigue is that either McCain or Salmon could face a difficult foe in the general election, after Democratic Rep. Ann Kirkpatrick surprisingly announced this week that she would run for Senate. The New York Times this week identified Kirkpatrick as McCain’s first “seasoned Democratic challenger” in his five Senate reelection bids, potentially setting him up against both his toughest Democratic opponent and primary challenger yet, at the same time.